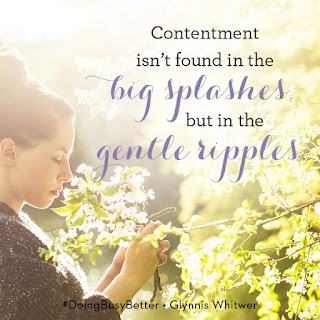 My sweet and wise friend, Glynnis Whitwer, has written a book many women need! 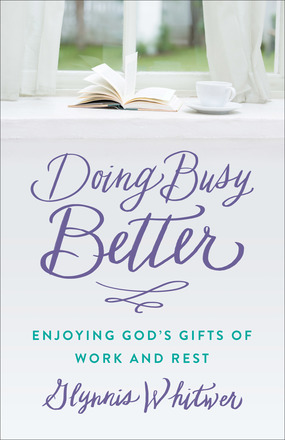 "Doing Busy Better: Enjoying God's Gifts of Work and Rest" helps us embrace the good kind of busy, the kind that is guilt-free and wisdom-infused. Most of us long for life to slow down. Maybe that’s why so many of us want a home that looks like a farmhouse. We idealize a lifestyle led by a simple faith and daily routines, prompted by the rising and setting sun. But I’ll be honest, I’d have to have a farmhouse with good wifi. I’m not sure I could give up my electronic devices. In fact, I’m pretty sure I have a slight addiction to my laptop and smartphone. And by slight I mean significant. And I am still waiting for my smartphone to make me smarter. Somehow I just feel dumber when I enter an appointment on my phone and it shows up on my computer—but not my phone. I can’t figure it out. It’s like they are in cahoots. I think if we were all honest, we’d be miserable if things slowed down. We’d much rather things hurry up. The problem is that hurry is the enemy of what matters most in life. We were designed to go at a slower pace, to ponder, to process thoughts one at a time. And when we try to go at computer speed, we miss out on what’s important in life. Hurry robs us of the beauty God has placed in front of us, and the grace that others so desperately need. Hurry is also a tool Satan uses to undermine God’s plan for us. Using hurry as a tool, Satan steals our contentment. As someone who struggles with her weight, I’m always looking for a tip to help me lose a few pounds. One tip is to eat slowly. WebMD reports that it takes twenty minutes from the time we start eating for the brain to tell the stomach it’s full. Until then, we will keep eating in order to experience that sensation of being full. And in that time, we will overeat. What a profound parallel to our need for speed in other areas of our lives. Could slowing down give us the time to feel content with what we have? When I’m in a hurry, I don’t appreciate the beauty around me. My awareness of others is diminished in my increased focus on the goal. I miss the small details of life that bring me the most joy in my rush. Contentment isn’t found in the big splashes but in the gentle ripples. Hurry isn’t our friend in the most important areas of life. Neither relationships, nor quality, nor depth can be found when we hurry. So the next time we feel that panic start to sneak in and push our gas pedal, let’s pause and breathe deeply. Refuse to be rushed. Declare that hurry has no place in the good work you are doing or the beautiful life God has placed before you. GIVEAWAY: Please leave a comment for your chance to WIN a signed copy of Glynnis's encouraging new book, "Doing Busy Better"! In Doing Busy Better, Glynnis helps you examine your heart and your schedule in order to seek a healthy, holy, and enjoyable balance between work and rest. Most importantly, she shows you that your worth is found not in your accomplishments but in the love of the One who made you for work and for rest. Glynnis Whitwer is Executive Director of Communications for Proverbs 31 Ministries, and contributor to their Encouragement for Today devotional, reaching over a million women each day. She’s the author of nine other books, including Taming the To-Do List and I Used to Be So Organized. She and her husband, Tod, live in Arizona and have five young-adult children. 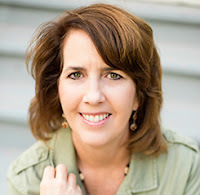 Connect with Glynnis at www.GlynnisWhitwer.com where she encourages women to live with margin and room to breathe while still getting things done. I love this statement ''Refuse to be rushed''- that is such a crucial reminder. I agree with you, hurry gets on the way of us actually living our lives. Sometimes I catch up myself missing full (weather) seasons because I am just focused on getting things done/commutting from one errand to another without lifting my head properly to see what is actually around me. That is how months go by before we get together with friends even when we live in the same city. It shouldn't be months, but I guess it takes discipline to set and stick to true priorities in life. It sounds like your book is such an important reminder of true values in life. But all who are hunting for you— oh, let them sing and be happy. Let those who know what you’re all about tell the world you’re great and not quitting. And me? I’m a mess. I’m nothing and have nothing: make something of me. You can do it; you’ve got what it takes— but God, don’t put it off. Thank you for these comments. I feel the panic of hurry when there are other people around. I want to put these comments into practice. Please Lord, help me to slow down, because I am missing so much of my family in this crazy race. Thank you for the post and the giveaway.